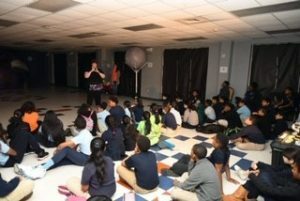 Queen City STEM Welcomes Orbit Earth Expo! 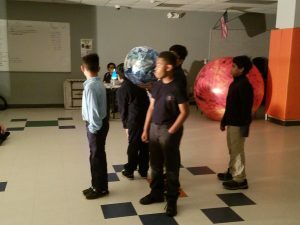 CHARLOTTE, NORTH CAROLINA – Queen City STEM hosted Orbit Earth Expo yesterday for grade K-3 and today for grades 4-8 as a part of STEM Day. Orbit Earth Expo is a SparkPoint Innovations astronomy program available to schools in NC aligned to grades K-8. Our models are SO big, they wouldn’t even fit in the gym! The students did an excellent job being flexible and caught on quickly to the modifications we made to the program and the substitute models. 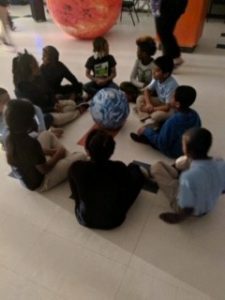 Students were on the ball, solving mysteries of the solar system as they explored rotation and revolution. Scale of the moon? Solved. Scale of the sun? No problem – but can you imagine if we were to bring the scale sized sun that would match Orb? No way! Orb wouldn’t even fit in your gym! Wouldn’t begin to fit in your neighborhood, much less your school! It’s a much better idea to bring a marble to match our sun model. We had some fun questions come up today, like how many earths would it take to fill up the sun? Answer? One million. Why is it currently 80 degrees in Brazil? The seasons in the Southern Hemisphere are the opposite of those here in the Northern Hemisphere, so they are moving from summer into fall. Wow! Thanks for having us to your school today! We can’t wait to see you again in the future.